Golden Cap, Lyme Regis, Dorset, S.England. These creatures first appeared 415 Million years ago in the form of a small, straight shelled creature, known as Bacrites, they quickly evolved into a variety of shapes and sizes. 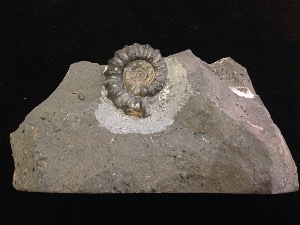 Ammonites were a predatory squid-like creature with a beak-like jaw, living in shallow waters, members of an extinct group of marine Cephalopods (subclass Ammonoidea), these creatures had a ribbed chambered shell which was either spiral, part spiral or straight. They lived on every continent with sizes ranging from 1mm to 2 meters in size, living about 2 years with a few exceptions of very large Ammonites living longer, the growth rate was very rapid with females growing up to 400% bigger than the males. Home was at the open end of their shell and they secreted chambers up behind themselves about one every 4 weeks (13 a year). 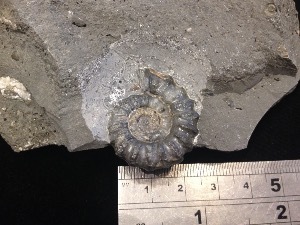 Ammonites moved through the water by jet propulsion, expelling water through a funnel-like opening to propel themselves in the opposite direction. 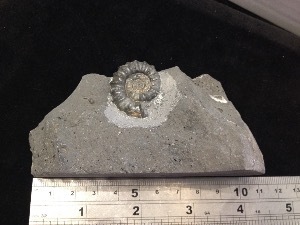 Ammonites found in certain types of clay are fossilises with a pearly lustre.